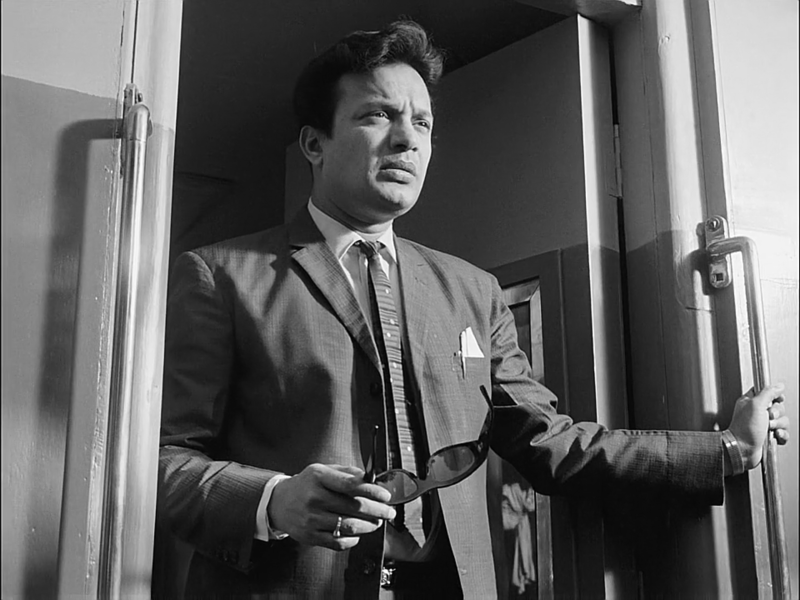 Written, directed, co-edited, and music by Satyajit Ray, Nayak (The Hero) is the story of a movie star being interviewed by a journalist on a train as he deals with his persona and status just as he’s traveling to receive a major award. The film is a study of a movie star as he looks back on his life and career as he’s also facing his first major failure as well as the image that he’s created. Starring Uttam Kumar, Sharmila Tagore, Bireswar Sen, Nirmal Gosh, Premangshu Bose, Somen Bose, Sumita Sanyal, Ranjit Sen, and Bharati Devi. Nayak is an evocative and riveting film from Satyajit Ray. A film star is traveling to Delhi via train to receive a major film award as he is also dealing with the scandal and the release of a new film that is likely to be a flop where he meets a journalist who is trying to get something for her women’s magazine. It’s a film that is told in the span of 24 hours as it play into a man that has to take a train to Delhi due to unavailable flights where he meets an array of passengers on the train as well as think about his past and other aspects of his life. Satyajit Ray’s screenplay doesn’t have much of a structure as much of the film is set in a train though it begins at a hotel where the film star Arindam Mukherjee (Uttam Kumar) is talking with his manager Jyoti (Nirmal Gosh) who is trying smooth things over. On the train, Mukherjee meets other passengers including a family that is staying in his compartment while an editor/journalist in Aditi Sengupta (Sharmila Tagore) is interested in interviewing him for her fledgling magazine. The interviews would force Mukherjee to think about past events in his life as well as a couple of surreal dreams that play into the decisions he’s made in his life. Ray’s direction does have a flair for style in the two dream sequences the film has yet he maintains an air of simplicity into his direction as well as shooting scenes on a train. While there’s some wide shots in some of the locations, much of Ray’s direction is intimate to play into the somewhat-claustrophobic feel of the train compartment and dining cars. There aren’t a lot of movements inside the train as Ray would use close-ups and medium shots to establish the setting as well as a reaction of the characters in scenes that add to the drama. For Mukherjee, Ray would create scenes that play into this man’s larger-than-life persona where he arrives to station or at a stop with people wanting his autograph yet he is given a chance to be himself at the compartment he’s sharing with a family. Ray would also play into the sense of isolation that would occur in not just Mukherjee who is coping with his identity. There’s also a couple whose husband is trying to get to know a businessman with the wife being used as a favor for the businessman as well as Sengupta’s friends trying to get her to interview Mukherjee for the magazine. The film would also contain sequences outside of the train as it relates to flashbacks and a couple of surreal dream sequences. The latter of which doesn’t just play into some of the regrets that Mukherjee has but also the anguish he’s dealing with as it relates to his fame. The flashback scenes has Ray showcase a man that is learning about his craft as an actor where he works with the veteran actor Mukunda Lahiri (Bireswar Sen) on his very first day as a film actor where Mukherjee copes with the disappointing experience while also wondering what his mentor in Shankar (Somen Bose) would’ve thought. Adding to the drama is flashbacks that has Mukherjee being famous where he deals with an old friend in Biresh (Premangshu Bose) who is a political activist as well as a young woman who wants to be an actress. It play into a man trying to protect his image but also one that is becoming more difficult due to his fame. Editing with Dulal Dutta, Ray’s approach to the editing would allow him to creating some unique rhythmic cut for the surreal dream sequences along with bits of jump-cuts for scenes on the train as it help add to the drama once the film progresses into its destination. Also serving as the film’s music composer, Ray’s score with its usage of traditional Indian strings and percussions do have some somber moments in the train with its serene orchestral pieces while using heavy percussions for the dream sequence to establish the guilt that Mukherjee is dealing with. Particularly as he would converse with Sengupta about his faults and knowing that his film will fail as Ray provides a sense of humanity into a man who is being seen by nearly everyone as something larger-than-life. Overall, Ray crafts an intoxicating and rapturous film about a film star traveling to Delhi via train as an interview with a journalist forces him to look back at his journey into stardom. Cinematographer Subrata Mitra does brilliant work with the film’s black-and-white cinematography where it has a straightforward look for many of the scenes in the train to the usage of stylish lights for some of the flashbacks and dream sequences. Art director Bansi Chandragupta does excellent work with the look of the hotel room and homes that Mukherjee live in as well as the look of the scenes in the dream sequences. The sound work of Nripen Paul, Atul Chatterjee, and Sujit Sakar is fantastic for the way a train sounds as well some of the scenes involving crowds. The film’s terrific cast include some notable small roles from Gopal Dey as the train conductor, Satya Banerjee as a swami who would chat with the businessman about a possible business venture late in the film, Jogesh Chatterjee as the elderly journalist who preferred silent films over the current films of the day, Subrata Sen Sharma and Jamuna Sinha as Sengupta’s friends who encourage her to interview Mukherjee, Kamu Mukherjee and Susmita Mukherjee as a traveling couple on business with the latter as the wife who feels mistreated by her husband who wants to pimp her out for business reasons, Ranjit Sen and Bharati Devi as the couple in the Bose who shares their compartment with Mukherjee, Lali Chowdhury as their fever-stricken daughter whom Mukherjee expresses concern for, and Sumita Sanyal as an aspiring actress in Promila Chatterjee who would audition for Mukherjee in a flashback as it would eventually lead to scandal for him. Premangshu Bose and Nirmal Gosh are superb in their respective roles as Mukherjee’s friends in Birish and Jyoti with the former being a political activist who wants Mukherjee to help him while the latter is Mukherjee’s manager who is trying to handle all of the issues that Mukherjee is dealing with. Somen Bose is excellent as Mukherjee’s mentor Shankar as a man who ran a theatre group that Mukherjee was a part of while isn’t fond about the idea of cinema believing that actors are puppets in the world of film. Bireswar Sen is brilliant as the veteran actor Mukunda Lahiri as a man who doesn’t seem fond of Mukherjee on Mukherjee’s first day while being someone who has a lot of pride yet is forced to deal with his failing fortunes when he turns to Mukherjee years later for help. Sharmila Tagore is amazing as Aditi Sengupta as a journalist/magazine editor trying to find a story for her magazine where she meets and interviews Mukherjee as she tries to understand what he’s dealing with while admitting to not being fond of his films due to their lack of realism. Finally, there’s Uttam Kumar in an incredible performance as the film star Arindam Mukherjee as a movie star who is traveling to Delhi to pick up an award as he deals with his persona as it’s a performance filled with some restraint as well as a befuddlement into the way things are as it’s a performance to see. The 2018 Region A/Region 1 Blu-Ray/DVD release from the Criterion Collection presents the film in a newly restored 2K digital transfer in the film’s original 1:33:1 theatrical aspect ratio with Dolby Digital mono sound (uncompressed in its Blu-Ray release) in its Bengali language with newly improved English subtitles. The special features include a 12-minute interview with actress Sharmila Tagore from a program back in 2008. 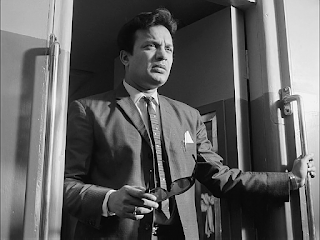 Tagore discusses working with Ray having collaborated with him in the film Apur Sansar when she was in her teens as she revealed that Ray didn’t work with the non-professional actors in the same he would direct more professional actors like Uttam Kumar whom he would give more instructions. While Kumar was a big star at the time, he was also quite humble and generous towards the less-experienced actors as Tagore revealed what Indian cinema was like before Ray which was more akin to a less realistic style. It’s a fascinating interview from someone who knew what Ray was about as well as the kind of films he’s made throughout his career. The 25-minute featurette from film scholar Meheli Sen has her talking about the film and its importance in not just Bengali/Indian cinema but also as a major turning point for Ray’s career. While it wasn’t a commercial success, the film did showcase a new territory that Ray was going to venture into as it relates to the growing sense of modernism that was emerging in India. Even as he would provide some criticism about the film industry in India that was more of a commercial market rather than an artistic platform. Sen also discusses the collaboration between Ray and Uttam Kumar as the latter was a major film star with Bengali/Indian audiences where Kumar was given the chance to play a role he would never have done before this film. The film also has Ray comment on his views on politics and why he’s apolitical as he would express it in a scene that has Mukherjee deal with the implications of his involvement. It’s a compelling piece that explain the film’s influence as well as the fact that Ray admittedly borrowed ideas for the film from Federico Fellini’s 8 ½. The DVD/Blu-Ray set also includes a booklet that features two pieces of text relating to the film. The first is an essay by novelist/writer Pico Iyer entitled Depths and Surfaces as it discusses the film and its themes. Iyer says the film marks the beginning of a new period for Ray as he wanted to make something more accessible but also say something about Bengali cinema and its lack of realism. Iyer also reveals that Ray was also full of contradictions about the films he’s made as it was about people in rural India yet they were seen more by people in New York City and Europe rather than the common man in India. Iyer also play into Ray’s need to maintain something real but also demystify the myths of the movie star where Iyer also talks about Kumar’s star power as he was considered a god-like figure as he took the film because he wanted a challenge and to work with Ray. It’s an essay that is riveting into the many ideas of Ray’s film. The second text piece entitled In Memory of Uttam Kumar is a eulogy written by Satyajit Ray at Kumar’s funeral in 1980 that was transcribed for a magazine journal 12 years later. It’s an earnest piece that has Ray talk about Kumar’s talents as an actor and their collaboration together where Ray talked about the sense of restraint and charisma that Kumar had. He also talked about the myth of stardom where he says it’s an accidental as he cites Gregory Peck as an example of someone who became a star by accident despite such hesitation from film producers. Ray also talked about Kumar’s method as an actor as someone who had a sense of patience and understanding of the characters he played as well as be someone who had a way of reciting dialogue that he believes no one could do. It’s a touching piece of text that has Ray pay tribute to a cinematic figure that not many people outside of Bengali/Indian cinema would probably have heard of. Nayak is a phenomenal film from Satyajit Ray that features tremendous performances from Uttam Kumar and Sharmila Tagore. Along with its gorgeous visuals, eerie music score, and captivating character study, it’s a film that explores a movie star dealing with his faults and the persona he’s created where he converses with a journalist who is trying to understand him. It’s also a film that has Ray exploring the complexities of iconic figures and their struggle to maintain a persona that also disconnects them from who they really are. In the end, Nayak is a spectacular film from Satyajit Ray.